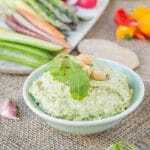 A great variation on traditional hummus. Soft goat's cheese adds a creaminess and lightness to the hummus, offset by the heat of the rocket leaves. Gluten Free. Blitz the chickpeas briefly in a food processor. Keep a few back for garnishing. Add the rest of the ingredients, blitz together to the desired consistency. If the hummus is too stiff, add some water to loosen it. Serve, garnished with rocket leaves and the remaining chickpeas. I used a soft fresh cheese for this - for a stronger flavour use a goats cheese log, or more mature soft goat's cheese. Once made the goat's cheese hummus will keep in a sealed container in the fridge for 3 days. You can of course whizz up the goats cheese and rocket with regular store bought hummus. Substitute some baby spinach for the rocket for for another twist on the recipe.